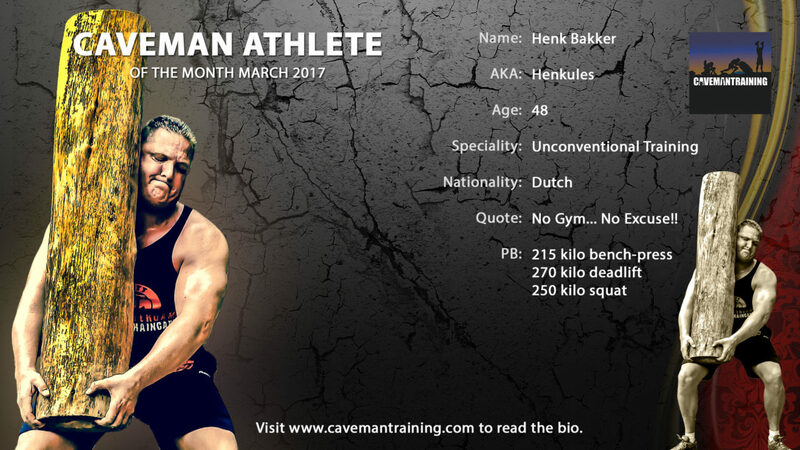 The Caveman Athlete Of The Month March is none other than Henk Bakker, AKA The Incredible Henkules. I started weight training/bodybuilding back in 1986 when I was 16 years old. I started training as a teenager because I was tall, slim and quite insecure about my body, so I wanted to develop more muscle. I made it my mission to make a change. My role models and motivators back then were Arnold Schwarzenegger, Frank Zane and the Dutchman Berry de Mey. For a long time my training was focussed on bodybuilding, but after six years I decided to change and focus more on strength training. I wanted a new challenge and I had talent to develop strength. There were a number of strength athletes at that time who entered strongest man competitions. That became my new challenge, I directed my full focus on strength, and after years of intensive training I belonged to a select group of power athletes who trained at a decent level for the strongest man competitions. At our gym also trained Ted van der Parre who won the title World’s Strongest Man 1993. Unfortunately and regrettably, I myself have never competed in a strongman competition. Having trained at a high level for many years I had to stop because of my health, I stopped for a year and decided to permanently say goodbye to the gym, because I no longer wanted to train with heavy weights under pressure of a group. In 2008, I wanted to start training again, but I did not know exactly what kind of training I wanted to do. One day I was watching TV and saw a Dutch gymnast who trained with heavy rubber bands. He did al kinds of exercises with those bands, I thought “this is great”, I went to the local sailing shop and bought a few meters of the heaviest elastics they had. I made handles on the rubber band and started training at home three times a week. Through my years of experience with weight training I wanted to combine the exercises through training with unusual weights. I came in contact with a manager of a company that sold anchors and ship-chains throughout the world, he wanted to sponsor mewith materials that I could use for my training, such as: anchors, chain-links and ship-chains. That was the first big step towards unconventional training. In addition, I also developed training tools out of tree trunks and built my own outdoor gym. Training with unusual weights became my passion and I’m proud to call myself an unconventional athlete. I train three to four times a week, I also train at my job as a fitness instructor in a Detention Centre at which I give fitness lessons to inmates. Some of my personal bests are; 40 reps shoulder press with a 60kg anchor; 20 reps one arm floor-press with a 50kg chain-link; and I like pulling a heavy 60kg anchor on the beach. I’m proud that I’ve written three articles for an American sports magazine MyMadMethods and I’m also one of the authors of Onnit Academy. But the crown on my work as unconventional athlete is that I’m honoured to be part of a great worldwide sports magazine called Unconventional Athletes which is also the magazine I was featured on the front cover off, which was a dream come true. I like to see more older people get into exercise, many older people are lonely or miss the social contacts and in sport you’ll be among other people. To those people I like to say: get out of your chair and get moving, every person has a need for social interaction. It does not matter what you do as long as you move. And last but not least, I want you all to know that you can workout wherever and whenever you want, you can create your own gym, or make use of your surroundings. Be creative, be unconventional! Make sure you nominate your favourite Caveman Athlete on our Facebook and hashtag it with #cavemanathletenomination Let Henkules know that you like Unconventional Training and share plus like this post here.